The disputed region of South Ossetia played an international for the first time last month when they travelled to fellow breakaway state Abkhazia for a friendly. Both regions are recognised by only 5 countries, including Russia, who are viewed by Georgia as occupying the 2 areas. 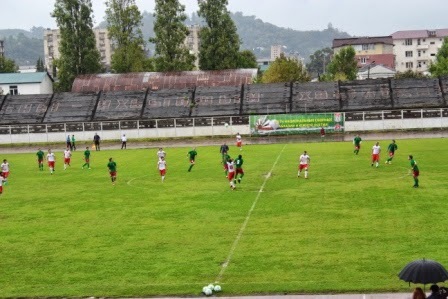 Abkhazia made their debut last year with 2 games against Nagorno-Karabakh and the proclaimed capital of Sukhumi was the venue for game on September 23rd. In pouring conditions the hosts seized the initiative early on when Russian-based Almaskhan Dzheniya headed home an Astamur Tarba free-kick following some slack South Ossetian marking. Shortly before half-time Enrik Pilia was fouled inside the box and goalkeeper Aleksei Bondarenko stepped up to coolly slot home for 2-0. Abkhazia failed to win in their 2 games against Nagorno-Karabakh last year but wrapped up their maiden victory when youngster Anrik Tania, fresh off the bench, took advantage of some more poor defending to make it 3-0. 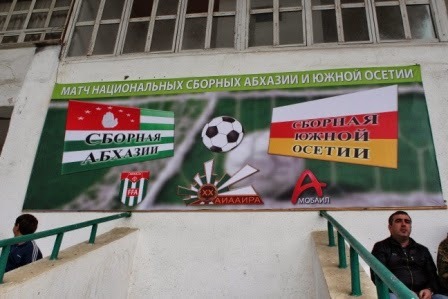 After the game veterans of the Abkhazian war were presented with gifts from the Abkhazia Football Federation and South Ossetia Chairman of the Sport Committee Sergey Zasseev stated “this is a historic date because in 20 years our teams have not met - this will forever remain in history”. Information on such teams is hard to find and it is difficult to say when these teams will play next, however, a link to a short video which includes highlights of the game is available here. Goals: Almaskhan Dzeniya ?, Aleksei Bondarenko ? (pen), Anrik Tania ? South Ossetia XI: ? ; Kabulov, Pukhayev, ?